Let’s say you finished up a wonderful GUI application using wxPython. How do you share it with the world? This is always the dilemma when you finish an amazing program. Fortunately, there are several ways you can share your code. If you want to share your code with other developers, than Github or a similar website is definitely a good way to do. I won’t be covering using Git or Mercurial here. Instead what you will learn here is how to turn your application into an executable. By turning your code into an executable, you can allow a user to just download the binary and run it without requiring them to download Python, your source code and your dependencies. All of those things will be bundled up into the executable instead. My latest book, Create GUI Applications with wxPython, is coming along nicely. I just wanted to let my readership know that the Kickstarter for it is coming to a close in a little less than 2 days. If you’d like to get a copy at a cheaper price than it will be when it is released in May later this year, the Kickstarter is really the way to go. You can check out the current table of contents in this post from last week. We are coming into the last week of the Kickstarter and I thought I would give you all a quick update. I finished writing up the chapter on creating a calculator today and got started on chapter 7. There will also be a chapter on creating executables and installers for your application and a couple of appendixes. 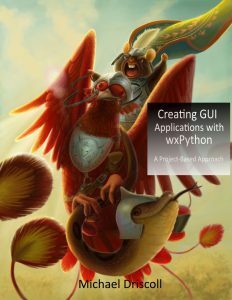 I am pleased to announce my latest book project, Creating GUI Applications with wxPython which I am running a Kickstarter campaign for. 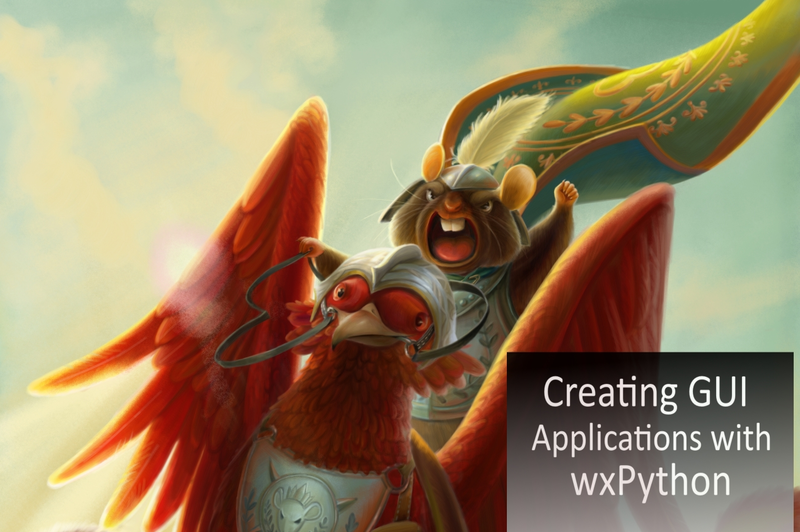 Creating GUI Applications with wxPython is a book that will teach you how to use wxPython to create applications by actually creating several mini-programs. I have found that while learning how the various widgets work in wxPython is valuable, it is even better to learn by creating a simple application that does something useful. The code in this book will be targeted for Python 3 only using wxPython 4. For more information, please check out the Kickstarter. The wxPython GUI toolkit has a very rich and powerful Grid widget that I have written about previously on this blog. It allows you to create sheets of cells similar to those in Microsoft Excel. There is also a neat mixin that allows you to apply a custom renderer to the labels on the columns and rows of the grid. Let’s break this down a bit. You will notice at the top of the code that we need to import the Grid widget separately in wxPython. We also need to import a mixin called GridWithLabelRenderersMixin. We subclass the Grid class and add in the mixin and then initialize both. Next we create a subclass of GridLabelRenderer, which is also from the mixin. This allows us to create a spacing Draw method that will give us the ability to apply different colors or fonts to the labels in our Grid. In this case, I just made it so that we could change the color of the text in the labels. The wxPython toolkit has dozens of pre-built widgets that you can use to create cross-platform user interfaces. The wxPython demo has a much more involved example than this article does that you might also find interesting. If you haven’t given wxPython a try, you really should go get it. It is pip installable from PyPI and compatible with Python 3. This week I am putting my 2 most recent self-published books on Sale starting today through November 26th. You can also get my book, wxPython Recipes, from Apress for $7 for a limited time with the following coupon code: cyberweek18. Python Interviews is $10 right now too! I see questions relating to the title of this article a lot. How do I open a second frame / window? How do I get all the frames to close when I close the main application? When you are first learning wxPython, these kinds of questions can be kind of hard to find answers for as you aren’t familiar enough with the framework or the terminology to know how to search for the answers.